Our versatile and portable table top lectern can be used on its own or as a floor lectern with the optional lectern base (sold separately). 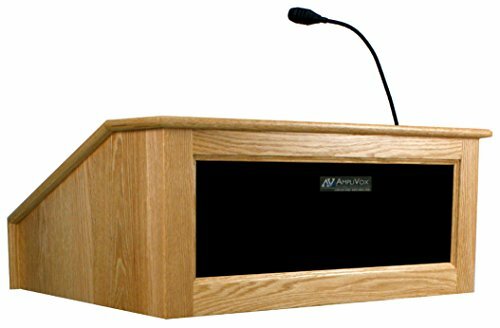 Our lectern is built on a firm MDF core with our stain and scratch resistant surface. 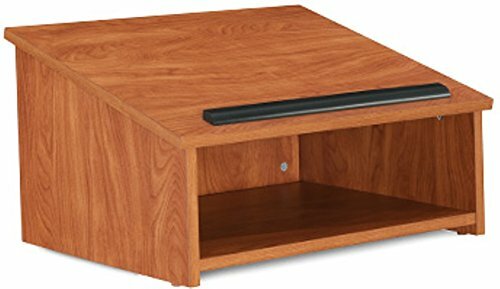 This tabletop lectern will provide you with a full reading surface with a built in book stopper. Storage compartment beneath reading surface is accessible and convenient. Measures 23-3/4" width by 13-3/4" height by 19-7/8" depth. Mahogany color. 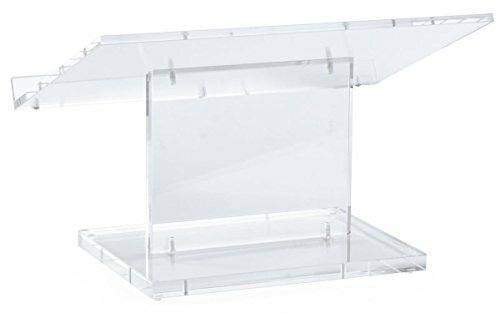 These acrylic podiums are designed for tabletop or countertop use. 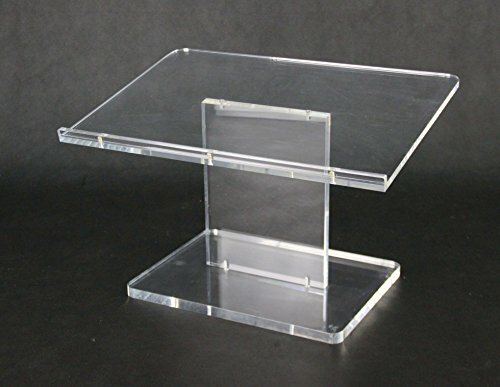 Each clear podium provides ample space for use as a book holder, and features a wide speaking surface and book lip. The 22-inch x 15-inch top surface is great for holding books, binders, a tablet computer, or sheets of paper. The book lip measures 1.3-inch and keeps materials from falling off. Each lectern is made from 0.5-inch custom fabricated acrylic panels and is polished for a pristine look. These podiums also have a heavy duty acrylic base for support. Each lectern is made with a knockdown style, for portability and storage. 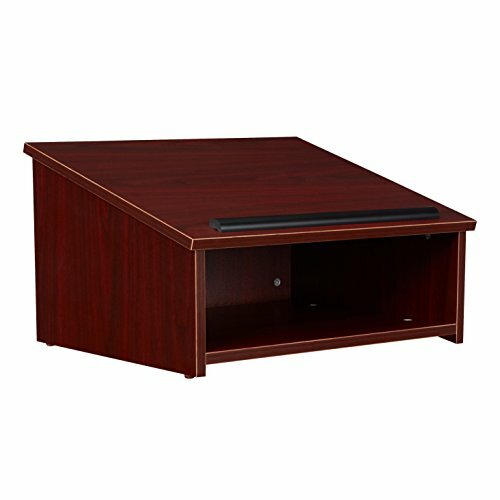 These are great for seminars and traveling conferences, as the units set up and take down in just minutes. Overall dimensions: 22-inch (W) x 14.3-inch (H) x 15.3-inch . Weight: 19 lbs. 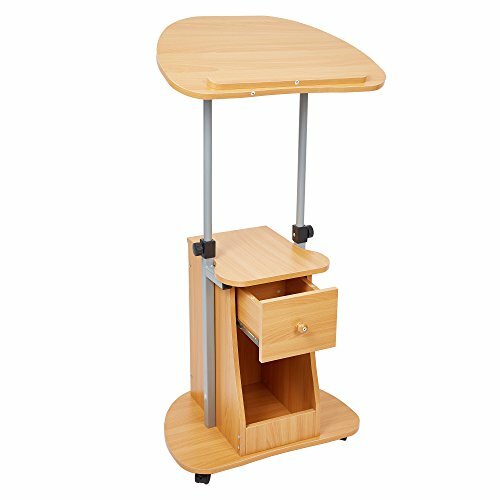 Tabletop Lectern Versatile and portable table top lectern can be used on its own or as a floor lectern with the optional lectern base (sold separately). 3/4" stain and scratch resistant thermofused melamine laminate on MDF. Paper/book stop included. Available in three colors. Our versatile and portable table top lectern can be used on its own or as a floor lectern with the optional lectern base (sold separately). 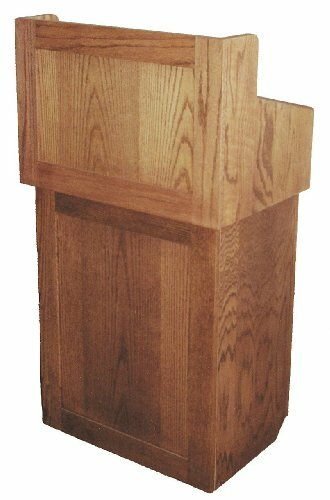 Our lectern is built on a firm MDF core with our stain and scratch resistant surface. 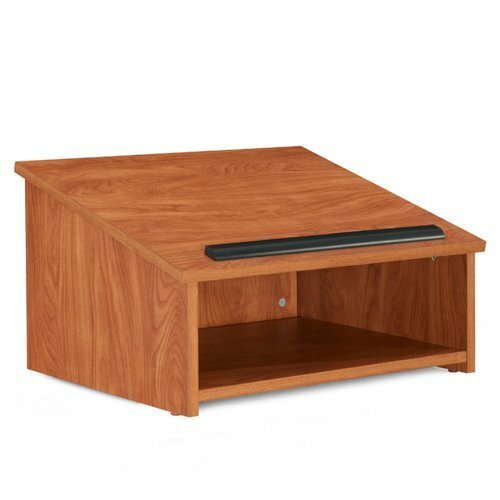 This tabletop lectern will provide you with a full reading surface with a built in book stopper. 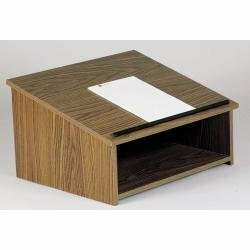 Storage compartment beneath reading surface is accessible and convenient. Measures 23-3/4" width by 13-3/4" height by 19-7/8" depth. Walnut color. Oklahoma Sound 22-CH Tabletop Lectern, Wild Cherry, Convenient paper/book stop, Large ample reading surface, High pressure thermal-fused laminate on a PB core, Durable scratch resistant surface #22 Tabletop Lectern Versatile and portable table top lectern can be used on its own or as a floor lectern with the optional lectern base (sold separately). 3⁄4" stain and scratch resistant thermofused melamine laminate on MDF. Paper/book stop included. Key Features Tabletop lectern functions great on its own or in conjunction with the #112 floor lectern base (sold separately) Convenient paper/book stop Large ample reading surface High pressure thermal-fused laminate on a PB core Durable scratch resistant surface Ships Ready to Assemble, UPS Specifications Dimensions: 13.75"H x 23.75"W x 19.875"D Weight: 35 lbs. 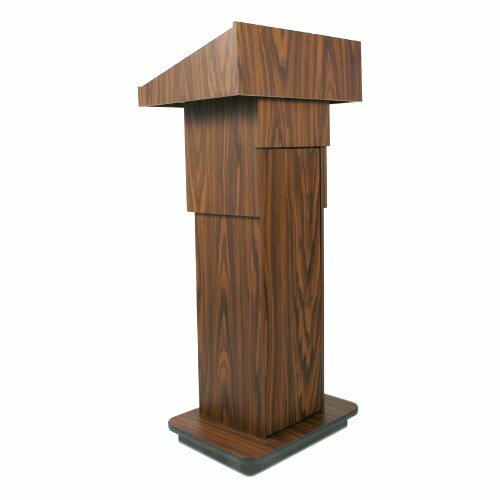 Brand:LivebestProduct:Lectern&PodiumColor:Wooden YellowMaterial:Wood Shaving Board,Steel TubeSize:22"*16"43.5"Weight:27.5lbsPackage:Stand up Laptop Desk*1Install Instruction*1Hardwares and Tool*1Trait:①Shaving board surface is easy to clean.②4 wheels won't scratch the floor,without loudly noise.③Several storage spaces.④Height and desktop angle are adjustable,please keep the desk balance.